Today’s animation is a fragment of a bone bead recovered in 1939 or 1940 by a Work Projects Administration (WPA) crew from the Fort Hill site, a Monongahela tradition village site located in Somerset County, Pennsylvania. It is now within the archaeological collections of The State Museum of Pennsylvania (TSMP). Today’s animation is a Genesee Broadspear point scanned at the New York State Museum (NYSM) in July 2014. This point was scanned to aid in the creation of a digital projectile point typology funded by the Department of Defense’s Legacy Program, as detailed here. Today’s animation is a Guilford point from the Doerschuck Site, North Carolina. This point was scanned on August 5, 2014 in the Research Laboratories of Archaeology at the University of North Carolina-Chapel Hill. The point is illustrated as Point C in Figure 35 on Page 40 of Coe’s 1964 work “Formative Cultures of the Carolina Piedmont,” Transactions of the American Philosophical Society, Volume 54, Part 5. 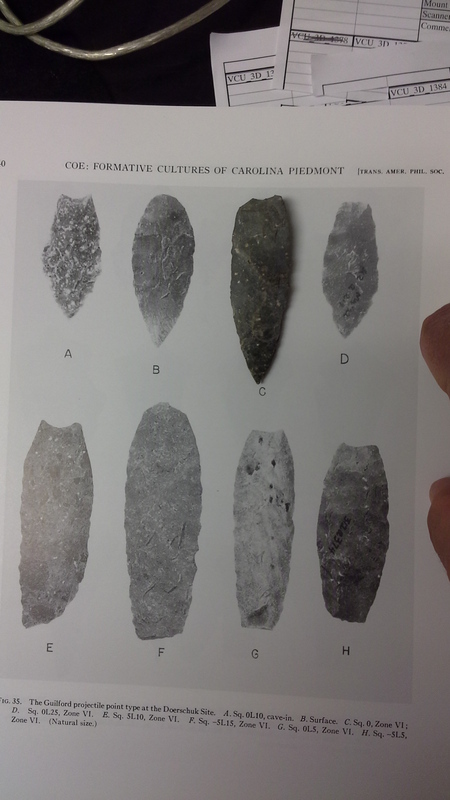 This point, as well as others from Coe’s (1964) monograph, were scanned to aid in the creation of a digital projectile point typology funded by the Department of Defense’s Legacy Program, as detailed here.